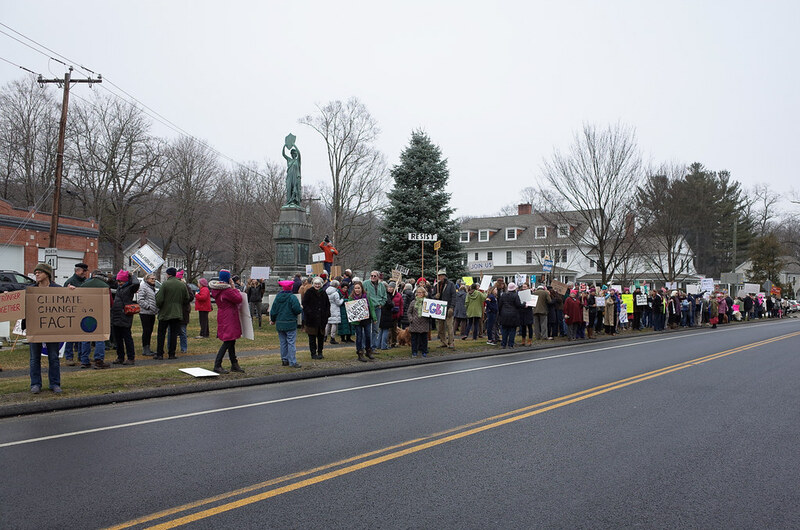 I found a “sister march” in a small town north of us and we decided to join there rather than in New York. It was very meaningful to get out among like-minded people from many of the small towns around this area and while many of us have been upset about the election, being together gave us a bit of hope. There were about 500 people at this gathering, no doubt one of the smaller marches that happened yesterday. Amazingly, through smartphones and social media, folks in our march were directly connected with friends and family in other marches the world over. I saw scenes of DC, New York, and numerous other marches in both the US and around the world. I have to say, even though I’m not active on social media (any more), just like the Green Revolution in Iran, it’s extremely useful to be able to see what’s going in other places on earth in real time. This was a significant demonstration, now let’s hope we can keep it up. That’s great! I was wondering if any of the smaller towns around the area did anything. Happy to see such a good turn out in Salisbury. I’m very glad there is a collective front to the direction things are going. Yes, the main Woman’s March site had a place to put one’s zip code to see if anything was happening near by. I hope/pray we have more of these at regular intervals to keep the pressure on this idiot.